Oh happy day! I was recently contacted by Elmer's with a crafty request. Try out some of the newest products that Elmer's has created and blog about it. So when a box full of supplies showed up on my door step, I got excited. When it comes to Elmer's- I have always thought of school glue. But it turns out they have an entire range of fun products- including foam boards and tacky glue. 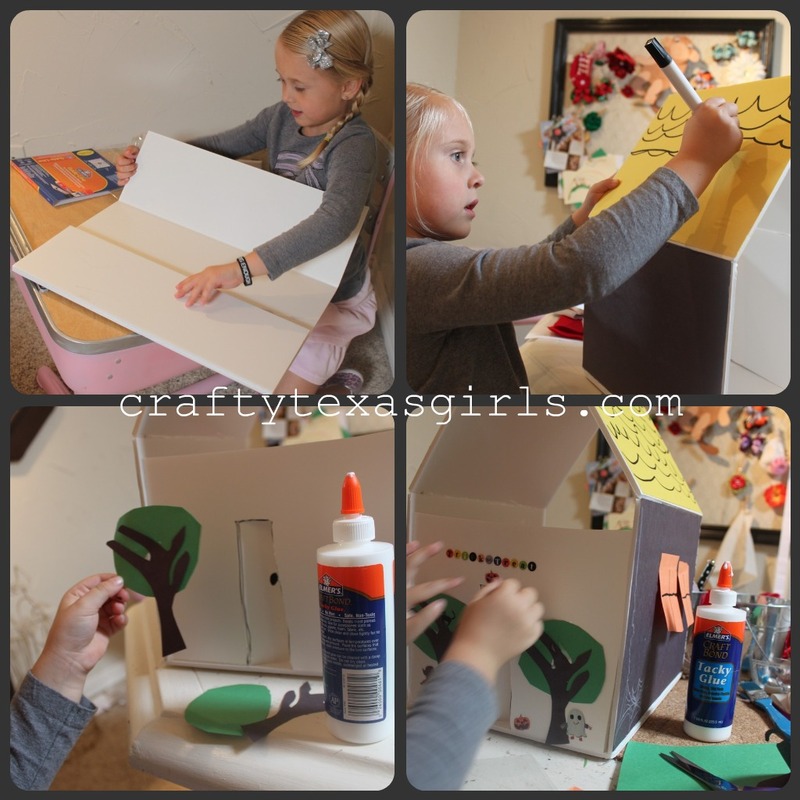 So everything from scrapbooking to home decor to holiday crafts can be created with their help. And even better, the people at Elmer's have created a collection of 101 Projects for inspiration. You can find lots of their ideas on the Elmer's facebook page . Afton had a day off from school recently, so she and I scrolled through the Elmer's Project Guide online. I told her to pick any project and that we would work on it together while Maisy napped. 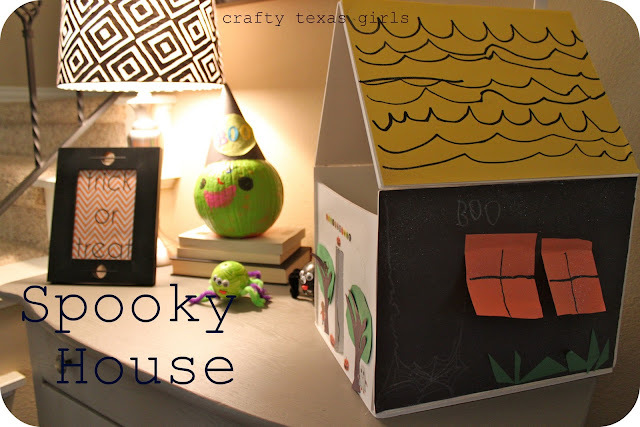 Of course the project that caught her eye was "Make a Haunted House". Using her imagination and the Elmer's supplies, Afton built a house. I used the X-ACTO knife provided to cut the shapes. Then she used scissors and the Elmer's glue to decorate it. We had some of the foam board left, so yesterday while Afton was in school and Maisy was napping, I created some original art for my new renovated bathroom. I used an image of a tree for inspiration and then used the X-ACTO knife and Elmer's foam board to cut it out. Then I covered a canvas in burlap and painted on a few chevron stripes. 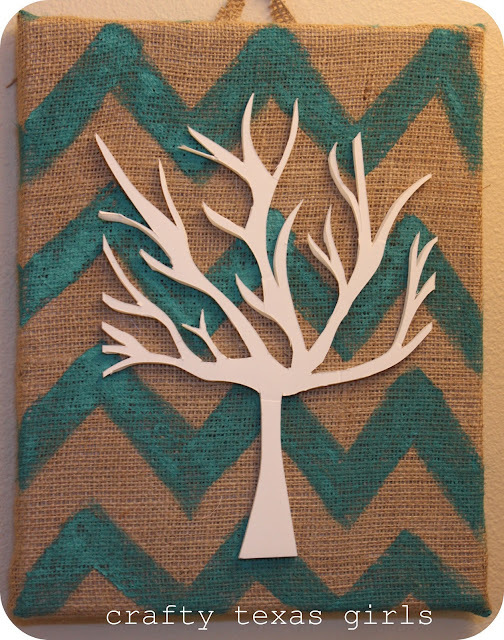 Finally I used the Elmer's craft glue to attach the tree to the burlap. The newly created artwork adds the perfect bit of color and texture to our guest bath. And whenever I see the tree I think of a quote I heard this week at church, "be willing to plant a seed for a tree whose shade you will never sit under." Thanks to Elmer's for the fun kit and the great project ideas. And now the best part is, Elmer's is giving away 2 kits to you- my crafty readers. And if you win, you can use your kit to create anything from photo puzzles, coasters, giant postcards, games to holiday houses, wreaths, or anything you can dream up. 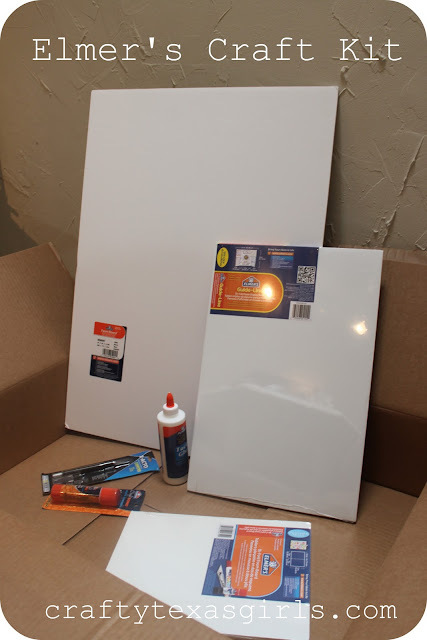 PRIZE: One Craft Kit from Elmer's-- 2 winners will be chosen. 1. 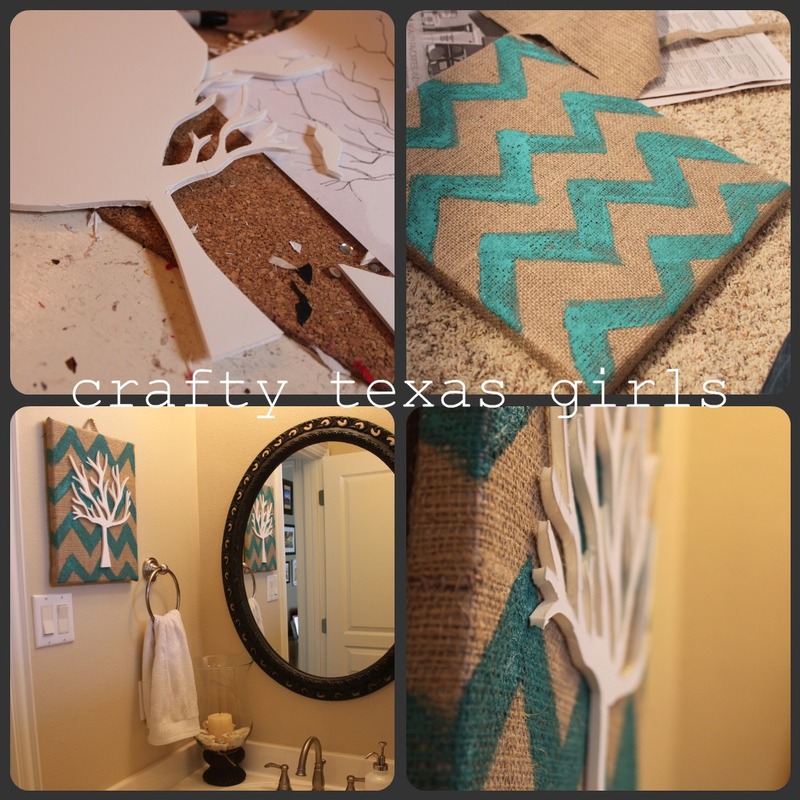 Become a follower of Crafty Texas Girls. 2. Visit my Crafty Texas Girls facebook page and leave this comment "I want to win the Elmer's Kit Giveaway because ______________". (fill in the blank with why you want to win!). * For an additional entry in this contest, blog, tweet, or facebook about the Crafty Texas Girls/Elmer's giveaway. Then leave the link in an additional comment on my Crafty Texas Girls facebook page. GIVEAWAY CLOSES: Thursday, Ocotber 27th at 8pm CST. PRIZE DETAILS: Winner will be emailed/facebook 'messaged' details the about how to claim their prize. OTHER INFO: Two winners will be selected using random.org from the comments left on my Crafty Texas Girls Facebook page. Winner will be announced in a new post on this blog and on my CTG facebook page on Friday, October 28th. So check back and see if you are the lucky winner! Thanks to: http://bloggiveawaydirectory.com/, http://freestuff.tipjunkie.com/ , http://www.online-sweepstakes.com/for listing this giveaway. I liked you on FB and shared my reason! I follow you on GFC and posted on your wall as Leslie Luke Stanzinai.Thanks!